No, that’s not a typo, and it’s not a quote that comes from the media coverage of protest against this year’s Canada 150 celebrations, although it certainly has the same feel. I came across this quote while working on new research this past week. It comes from Chief Georges Erasmus, who at the time was head of the Assembly of First Nations. He was commenting on plans for Canada 125 celebrations to be held in 1992 (and the possible, but ultimately abandoned, Canadian celebrations of the 500th anniversary of Columbus’ arrival in the Americas). It is striking how history repeats itself, and also disheartening to note the slow pace of change on key problems facing this country. July 1st marks the 150th anniversary of the day that the British North America Act came into effect in 1867. I will be Ottawa, among the anticipated half million people in the crowds around Parliament Hill. 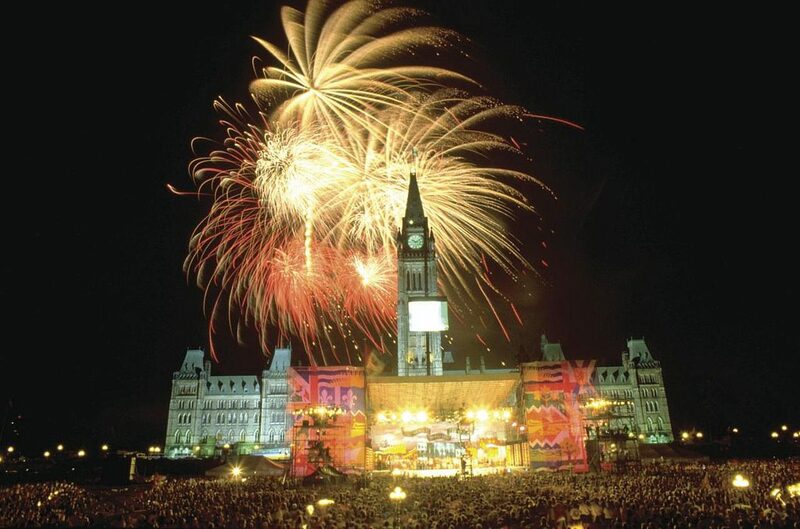 Since the late-1950s Ottawa has been a major destination for those who want to celebrate the anniversary of Confederation, first as Dominion Day, and then as Canada Day, as it was renamed by a private member’s bill in July 1982 (in a parliamentary maneouvre that still arouses the ire of die-hard Dominion Day defenders). Alongside the crowds who seek to celebrate on Canada Day, and throughout this year, there is also a vocal contingent who oppose these events. Active History has posted other thoughtful commentaries about the contestation of Canada 150 this year. What I would like to suggest in this post is that such contestation of national days and major anniversaries is part and parcel of how Canada marks its political anniversaries. It always has been the case. Moreover, as I have written elsewhere, I think that this kind of vigorous engagement with these celebrations or commemorations, whether through protest or through participation, is both a good and a necessary process. Problematic though it is, there is a greater sense of patriotism and nationalism among the Canadian population than is often acknowledged. National days, including Canada Day, and mega-anniversaries (like the Diamond Jubilee of 1927, the Centennial, Canada 125 or Canada 150) are times when these sentiments are prone to rise to the surface. But they are also times when people are thinking actively – if not necessarily critically – about their country, their province, their nation, or their community. For this reason, there is a long tradition of governments in Canada trying to make use of these days and years to foster particular conceptions of identity. There has also been a strong tradition of groups who have attempted to make use of these same events to seek inclusion in national or community narratives, or to try to change these conceptualizations of nation, identity or community. When attention is focused on these issues, the possibility exists to change the stories told about the past, and the pathways followed to the future. In February of this year, I was in Ottawa to give a talk for the Federation for the Humanities and Social Sciences’ “Big Thinking” series about issues related to Canada 150 and the broader history of celebrations and commemorative events in Canada. In connection with that talk, the Federation asked me to write an op-ed piece. It ultimately ran in the Ottawa Citizen, but only after I agreed to modify the lead paragraph. The Citizen’s opinions editor didn’t think that celebrating Canada 150 was considered controversial, at least not in the view of Ottawa residents. I think it’s fair to say that time has proven me correct. When I penned that piece back in the winter, various groups were already organizing around themes such as “Colonialism 150” and “Resistance 150”. Since that time, a host of other people have challenged, contested, or problematized the celebration of the 150th anniversary of Confederation, including Twitter-based forms like “#Unsettle150” and “#Resist 150” or the @canada1504sale account. A common thread through much of this activism has been the argument that for the Indigenous peoples of Canada, there is nothing to celebrate about the past 150 years of this country’s existence. As the lead-off quote of this piece shows, almost precisely the same types of arguments that we have heard this year were being raised in 1992 to argue against celebrating the 125th anniversary of Confederation. The Oka crisis was still in very recent memory, and Canada was in the midst of the constitutional crisis occasioned by the failure of the Meech Lake Accord. The federal government (given its unpopularity) had opted to distance itself from being seen as organizer of the events, placing their organization in the hands of a new, arm’s length, non-profit Canada 125 corporation. The national mood, if such a thing can be claimed to exist, was one of gloom and pessimism, not least because of an ongoing recession. And yet, the decision was made to proceed with celebrations. Part of what drove this decision is worth bearing in mind today. Polls conducted early on in the planning process showed that, despite the general sense of pessimism, fully a third of the population were people who might be considered “keen partiers”. These individuals were intensely proud of their country, considered Canada the best country in the world, and wanted a big celebration. Almost another 40% thought that something “meaningful” should be done to mark the 125th anniversary of Confederation. Another 17% were ambivalent about the whole thing. Thus, there was a large constituency that both expected and wanted something to be done to celebrate, or at least observe, this political anniversary, albeit with different senses of how this should be done. From the perspective of the government, it was important to engage with this large cohort of Canadians who wanted to observe Canada 125, and to try to do so in ways that would be both thoughtful and meaningful, rather than blandly celebratory. 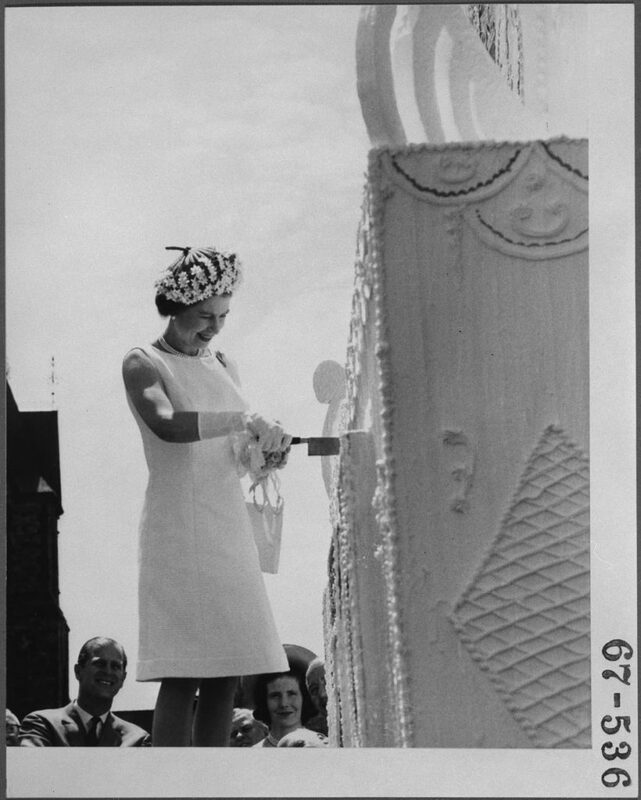 In the late-1960s, a variety of different approaches were taken to Indigenous engagement with provincial and national centennial celebrations. Susan Roy’s work has discussed how Musqueam communities opted to perform at various events associated with British Columbia’s 1966 centennial activities, believing that it was important to present their own narratives of their culture and history. [iv] Similarly, Myra Rutherdale and Jim Miller have noted how the Indian Pavilion at Expo 67, an event not officially organized by or associated with the Centennial, but nevertheless wrapped up in its atmosphere, provided an opportunity for First Nations to challenge the positive narratives of Canadian history that were otherwise present in that year’s events. [v] However, such participation, as these authors have noted, and Jane Griffith has expanded upon,[vi] did not guarantee that other Canadians would either understand or accept the messages they were being presented with. 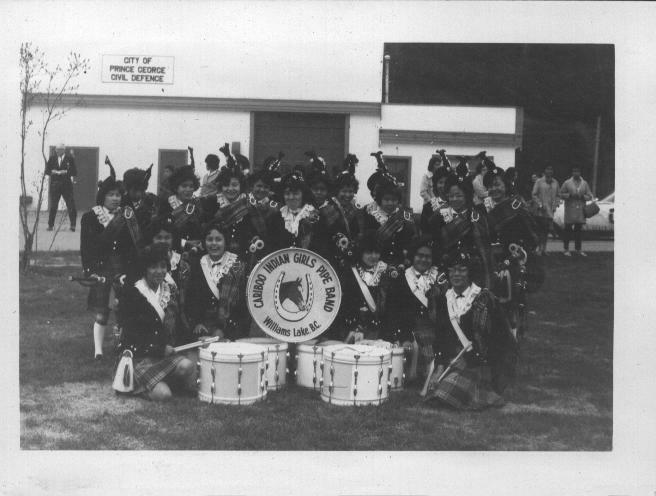 Cariboo Indian Girls Pipe Band, Prince George, 1960s. Jim Callanan/Lejac Indian Residential School blog. But we can also see more positive messages associated with these celebrations. At the Canada 125 celebrations in Ottawa on Canada Day in 1992, Inuit singer Susan Aglukark spoke of how proud she was to have just recorded the first-ever Inuk music video. Métis actress and writer Tantoo Cardinal was able to deliver the message that Canadians need the courage to admit errors of the past. She spoke of how Indigenous peoples have survived the banning of their native languages, how they have survived the banning of their music, and how they have survived the banning of their culture. She then introduced the rock band Kashtin, who performed in the Innu-aimun (Montagnais) language. These forms of engagement and contestation do not always lead to policy changes in the short term. But they speak to the importance of national days and national anniversaries as opportunities to change the conversations and understandings that Canadians have about the country’s past, present, and future. To not celebrate or mark these anniversaries, I would argue, is more likely to produce an unproductive backlash from that cohort of “keen partiers” and perhaps even the “meaningful” celebrators mentioned above. Rather than rejecting their views as being entirely wrong-headed and opting not to celebrate at all, I think that our history has demonstrated that it is better to take advantage of how these events provide a special opportunity to engage with, and hopefully educate, at least part of these segments of the population. A single speech or performance at a Canada Day event may not be enough to shake off a lifetime of beliefs. But it may plant the seed of new conceptions of Canada that can germinate in the future and provide broader support among the population for new policies. Matthew Hayday is a professor of Canadian history at the University of Guelph. He has published extensively on issues related to Canadian identity and nationalism, and particularly about the history of Canada Day. His most recent publication on the subject is the co-edited volume Celebrating Canada, volume 1: Holidays, National Days, and the Crafting of Identities (University of Toronto Press, 2016). [i] Georges Erasmus, quoted in Nancy Baele, “Native Artists Portray their own Reality,” Ottawa Citizen, 19 April 1992. [ii] Lianbi Zhu and Timothy Baycroft, “A Chinese Counterpart to Dominion Day: Chinese Humiliation Day in Interwar Canada, 1924-1930” in Celebrating Canada, volume 1: Holidays, National Days, and the Crafting of Identities, ed. Matthew Hayday and Raymond B. Blake (Toronto: University of Toronto Press, 2016): 244-273. [iii] Forrest Pass, “Dominion Day and the Rites of Regionalism in British Columbia, 1867-1937,” in Celebrating Canada, volume 1: Holidays, National Days, and the Crafting of Identities, ed. Matthew Hayday and Raymond B. Blake (Toronto: University of Toronto Press, 2016): 191-219. [iv] Susan Roy, “Performing Musqueam Culture and History at British Columbia’s 1966 Centennial Celebrations,” BC Studies 135 (Autumn 2002): 55-90. [v] Myra Rutherdale and Jim Miller, ““It’s Our Country”: First Nations’ Participation in the Indian Pavilion at Expo 67,” Journal of the Canadian Historical Association 17, 2 (2006): 148-173. [vi] Jane Griffith, “One Little, Two Little, Three Canadians: The Indians of Canada Pavilion and Public Pedagogy, Expo 1967,” Journal of Canadian Studies 49, 2 (Spring 2015): 171-204. [viii] Bev Sellars, They Called Me Number One: Secrets and Survival at an Indian Residential School. (Vancouver: Talonbooks, 2013).